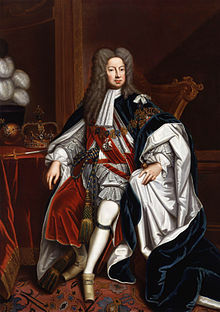 George I (George Louis; German: Georg Ludwig; 28 Mey 1660 – 11 Juin 1727) wis Keeng o Great Breetain an Ireland frae 1 August 1714 till his daith, an ruler o the Duchy an Electorate o Brunswick-Lüneburg (Hanover) in the Holy Roman Empire frae 1698. George wis born in Hanover an inheritit the teetles an launds o the Duchy o Brunswick-Lüneburg frae his faither an uncles. A succession o European wars expandit his German domains in his lifetime, an in 1708 he wis ratified as prince-elector o Hanover. At the age o 54, efter the daith o his seicont cuisin Queen Anne o Great Breetain, George ascendit the Breetish throne as the first monarch o the Hoose o Hanover. Awtho ower 50 Roman Catholics war closer tae Anne bi primogenitur, the Act of Settlement 1701 prohibitit Catholics frae inheritin the Breetish throne; George wis Anne's closest leevin Protestant relative. In reaction, Jacobites attemptit tae depose George an replace him wi Anne's Catholic hauf-brither, James Francis Edward Stuart, but thair attempts failed. In George's ring, the pouers o the monarchy diminished an Breetain begoud a transeetion tae the modren seestem o cabinet govrenment led bi a prime meenister. Taewart the end o his ring, actual poleetical pouer wis held bi Robert Walpole, nou recognised as Breetain's first de facto prime meenister. George dee'd of a stroke on a trip tae his native Hanover, whaur he wis buiried. ↑ 1.0 1.1 1.2 Throughoot George's life, Great Breetain uised the Auld Style Julian calendar. Hanover adoptit the New Style Gregorian calendar on 1 Mairch 1700 (N.S.) / 19 Februar 1700 (O.S.). Auld Style is uised for dates in this airticle unless itherwise indicatit; however, years are assumed tae stairt frae 1 Januar an nae 25 Mairch, which wis the Inglis New Year. This page wis last eeditit on 8 Februar 2018, at 23:09.